5 Minute Natural Make Up Routine! So you need to cut some corners because you still have to have a semi-even skin tone for the day! The result of this quick routine will be a brighter, more even skin tone, and a more defined eye area. 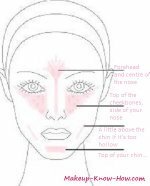 Highlighter- If your foundation is not a highlighting/ brightening foundation, add one or two drops of highlighter to your tinted foundation mixture. Be very frugal with it because you don’t want a lot. Mix the tinted moisturizer on your hand and apply all over your face. You can use your hands or a damp sponge. Tinted moisturizer with highlighter gives you light coverage. It will even out and brighten your skin tone. Even though most flaws will fade, but not be covered. Apply the highlighter across your cheekbones, from right under your eyes. Then blend it downwards over your cheeks in a triangle shape. Tight line your eyes with brown eyeliner. So you basically just line the top and bottom waterline, and do your best to line the actual lashline. Then take a brush and smudge the eyeliner at the lash line, and brush your eyebrows out to blend the liner in. Apply mascara by wiggling from the bottom upwards. Mascara should be the same color as your actual lashes. This will give you the most natural look. Finish off with just a few dabs of blush to the apples your cheeks, and then some tinted gloss. Tinted gloss, or neutral lipstick are low maintenance.